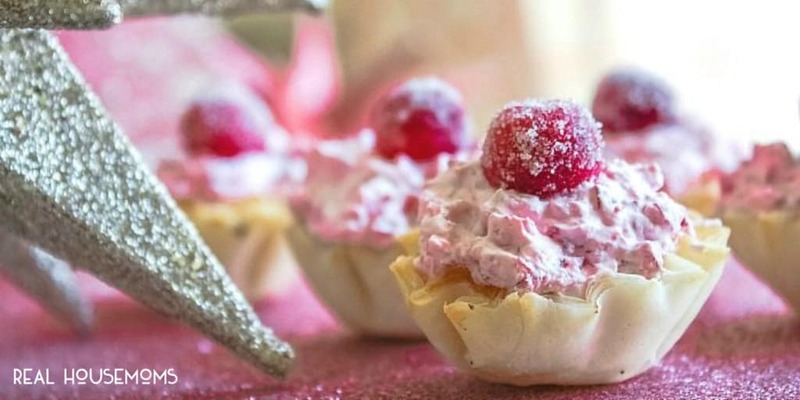 These Cranberry Fluff Cheesecake Bites are the perfect no-bake dessert for the holidays! I don’t know what it is about a bite-sized dessert that makes me so happy but I just love them! Maybe it’s because I can try so many different tasty treats, maybe it’s just because I can eat 2 or 3 without feeling guilty, or maybe it’s because they are so pretty. Whatever it is when the holidays come I go on a bite-size dessert and appetizer spree and you can bet just about every recipe I make will come in a smaller size than usual. 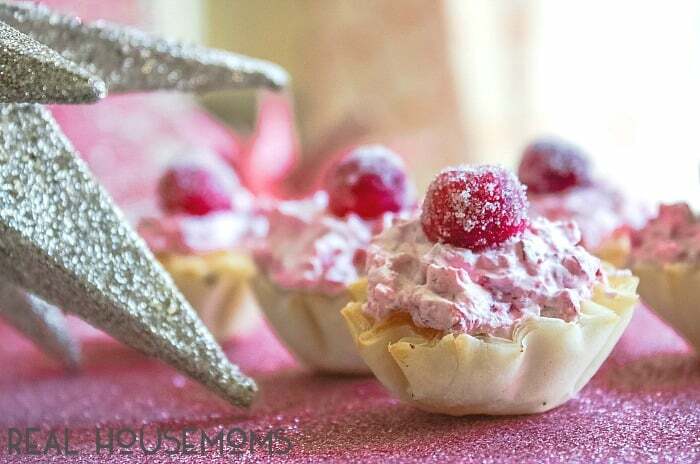 These beautiful little no-bake Cranberry Fluff Cheesecake Bites are no exception and I’m telling you they are going to be a hit at your upcoming holiday parties! 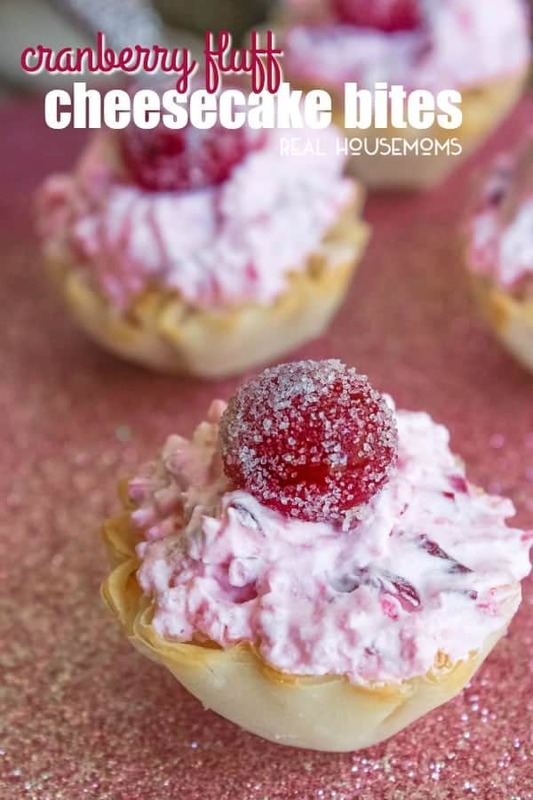 I’ve been all about cranberry fluff this year and after the success of my Mini Cranberry Fluff Cakes I wanted to try something using cranberry fluff that was even easier. You don’t get much easier than a no-bake dessert right? My cranberry fluff cheesecake bites use a no-bake cheesecake made from a mixture of cream cheese, sugar, and vanilla extract. You pipe the cheesecake into pre-made phyllo cups and then top it with delicious, marshmallowy cranberry fluff. The cranberry fluff recipe is my grandma’sand it has been a family favorite ever since I can remember. We always just ate it all on its own along with Thanksgiving or Christmas dinner, who knew it could be turned into so many awesome desserts?! 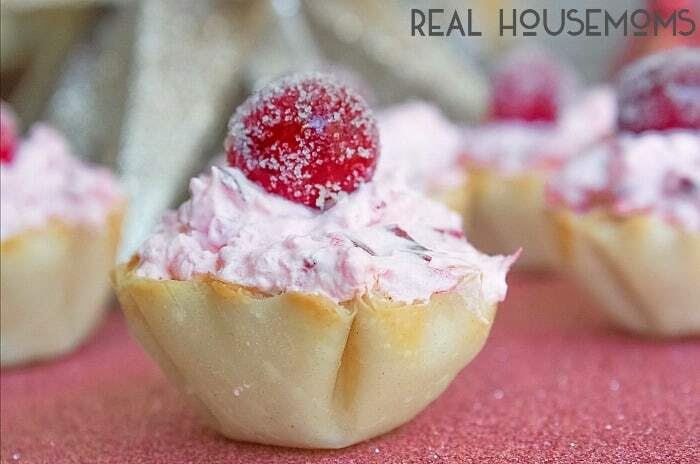 Besides being super cute and totally delicious these cranberry fluff cheesecake bites are perfect for the holidays because the cranberry fluff and the no-bake cheesecake can be made ahead of time so all you have to do on party night is assemble and serve. Make sure you make a bunch because they are going to disappear fast! Classic cranberry fluff and no-bake cheesecake combined into one delicious bite! Pipe a small amount (about a 2 teaspoons) of no-bake cheesecake in each phyllo shell. Top each one with cranberry fluff (about the tablespoons). What could you use instead of pineapple, I’m very allergic. Papaya or mango are probably going to be the best options. You could also use orange. I have a similar recipe that uses orange and it’s delish. How are you preparing the cranberry for garnish? 1. Add water and 1/2 cup of sugar to a small saucepan and cook it over medium-high heat until the sugar has completely dissolved. 2. Add the cranberries and stir them in the sugar solution until they thoroughly coated. 3. Remove them from the sugar solution and place them on a silicone mat or a piece of parchment paper to dry for about 1 hour. 4. Roll the cranberries in the remaining sugar and set to the side until you are ready to use them.